I regret to inform you that today's pack of 2011 Topps Chrome is utterly craptastic, one of those few packs that actually has no refractor and then the base cards aren't all that great either other than the fact that I need them for my base set... so, enjoy your 4 base today, I promise a hit tomorrow!!! Ok, so there are some decent players, the Strasburger being one of them, so while boring I guess since I ranted about the base refractors, I shouldn't complain about an all base pack! 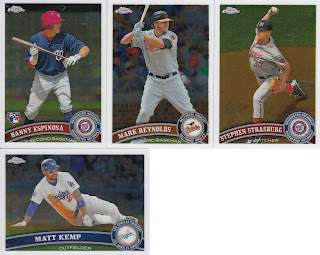 A pack with Matt Kemp is inherently un-lame. No David Wright at least. "The Lamest Pack" in your title isn't going to help you get hits on the blog Sam! Ha. There don't seem to be too many packs without at least a base refractor.